Are you trying to get healthy or lose weight? If so, you’re probably working to make healthy choices about the food you eat. But watch out – some “healthy” foods may not be as good for you as you think! Soups. While soups can be good for you and low in calories, remember that not all soups are created equal. Some soups contain unhealthy amounts of sodium and fat. Tomato basil soup, for example, is often made from a cream base that it’s high in calories and extra fat. Fruit juices. Many people choose to give up soft drinks in order to get healthy. But reaching for a fruit juice many not be much better. The trick is to find out how much of what you’re drinking actually came from a fruit. Some fruit “drinks” contain very little fruit and lots of added ingredients like high-fructose corn syrup and other sugars. Read your labels carefully, paying special attention to the ingredients list. Energy bars and drinks. 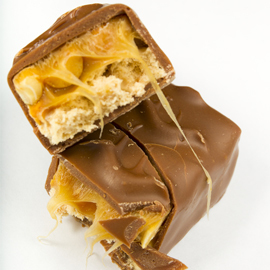 Nutritionists warn against turning to “glorified candy bars” for extra energy. Check the ingredients to make sure that a whole grain is one of the first ingredients listed and sugar is one of the last. Oils. It’s become increasingly popular to cook with natural oils, such as olive oil and avocado oil. But experts warn about adding too much of a good thing to your cooking. Limit yourself to 1 tablespoon of oil for your whole dinner. Nuts. While nuts can be a healthy snack alternative, it’s also easy to eat too many of them. The key is to practice moderation, limiting yourself to no more than one-quarter cup a day.